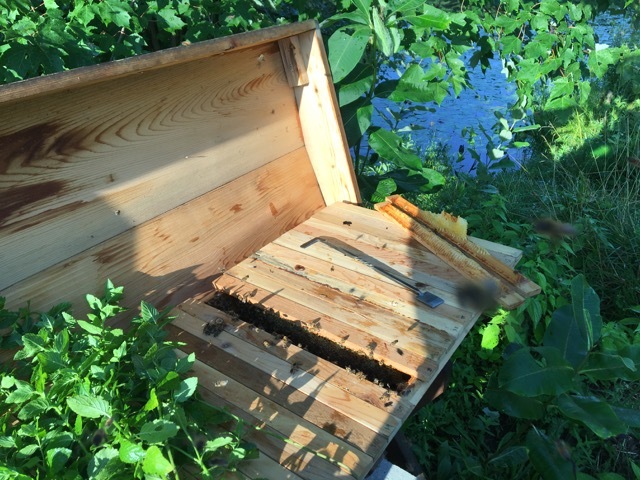 It’s been a month since I have inspected the hives. 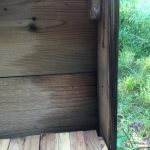 This season I have tried to get into the hives every two weeks or so. 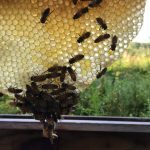 Being in the hives so frequently has allowed me to see more of how things work in the hives as the seasons change. 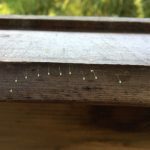 This year I have seen a lot of things that I have not seen before, some because I am in the hives more frequently and some because there have been some curious things going on in the hives. 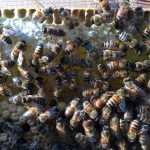 One of the most curious things that I have witnessed this year is the replacing of queens. 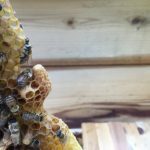 Two of the colonies that I have replaced their original queens and some other beekeepers that I know have had similar situations. 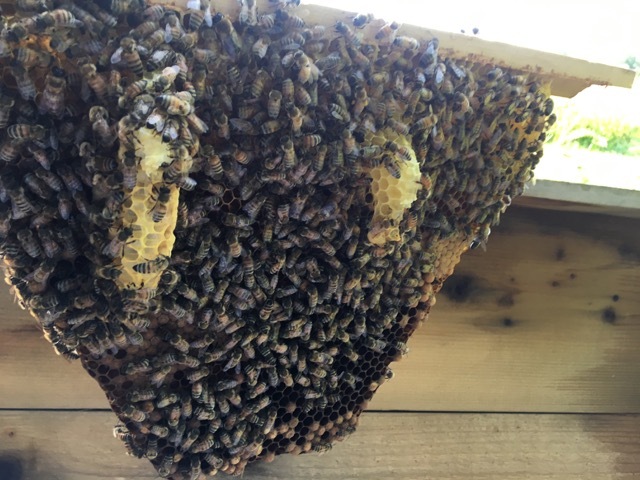 This was a first for me, my colonies had not tried to replace their queens in the past except the colonies that had swarmed. It all just makes me wonder what is causing that behavior, what is wrong with those original queens? These are questions that I may never have answers to. 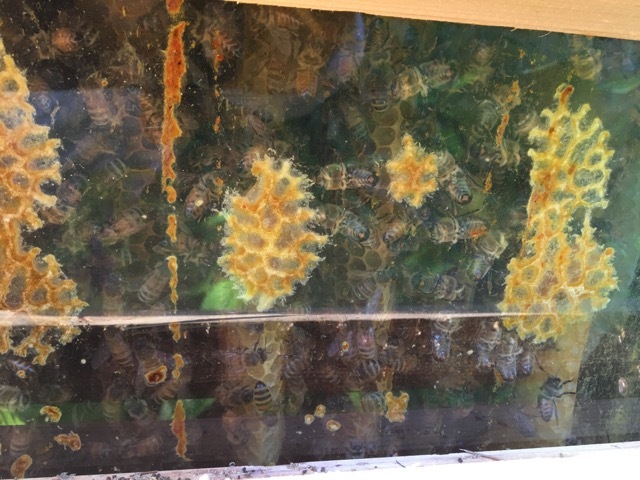 After returning from Norway, I was excited to get back into the hives and see how the colonies were doing. Of course, I was also wondering if there were going to be any messes or disasters to deal with. 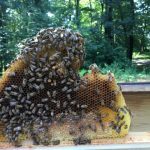 It had only been 4 weeks, so I was hopeful that the colonies were fine and that everything in the hives was good. 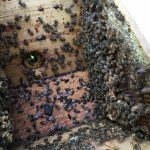 The Willow Hive was first on the list. 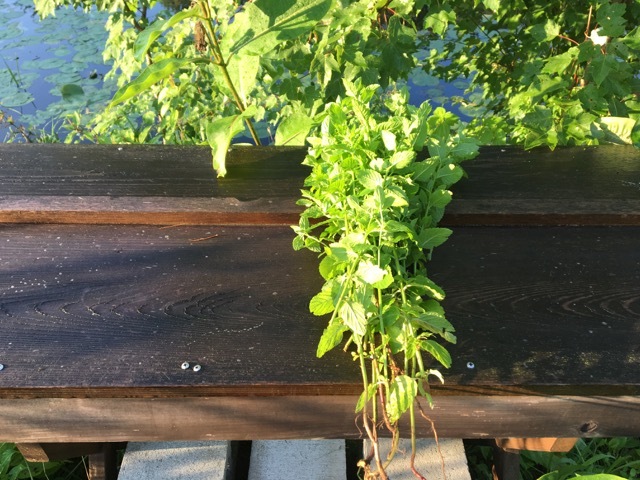 This time I brought fresh mint stems from my garden to try to deter the mice from trying to nest in the space above the bars. 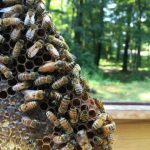 The last time I was in this hive, they were still queenless. 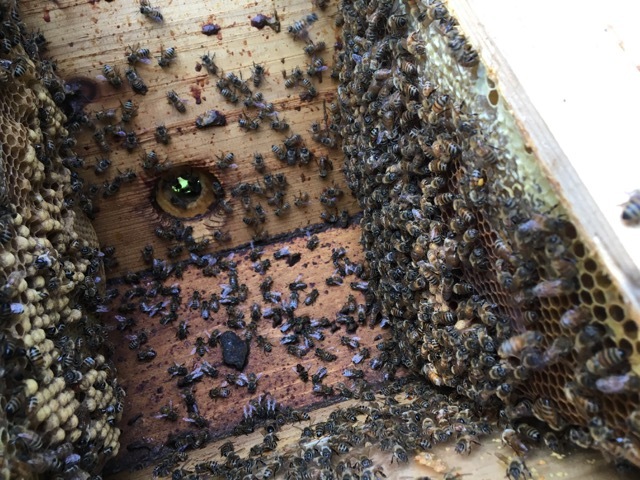 This time there was a nice, plump mated queen! However, they were still grumpy and a bit combative. 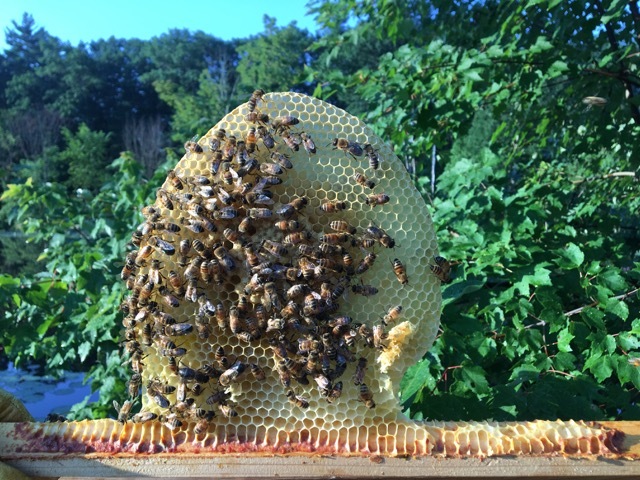 The bees were not building any new comb at this point. 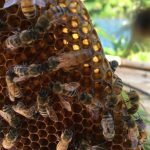 This is usually the time of year that I see either a slow down or a complete stopping of comb building, so this wasn’t a surprise. 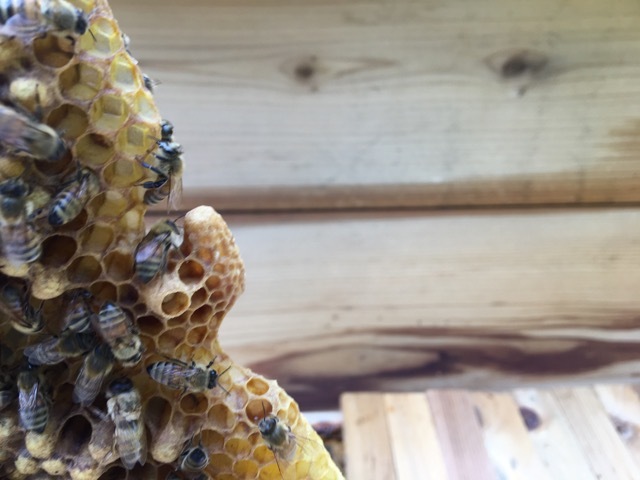 There was a good amount of brood in the hive this time. 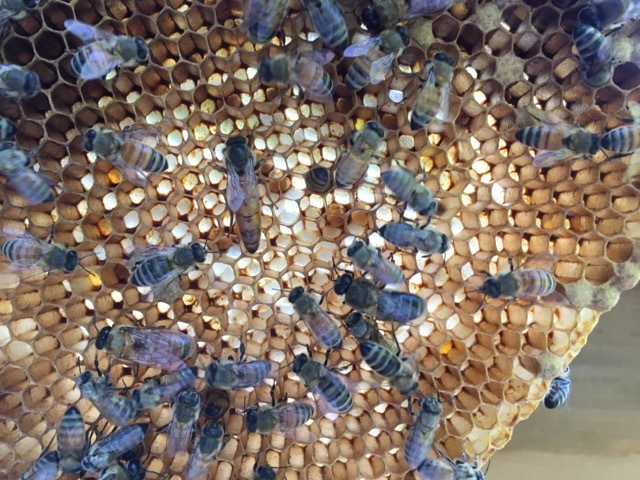 This new queen is doing very well and she is working hard at increasing the size of this colony. 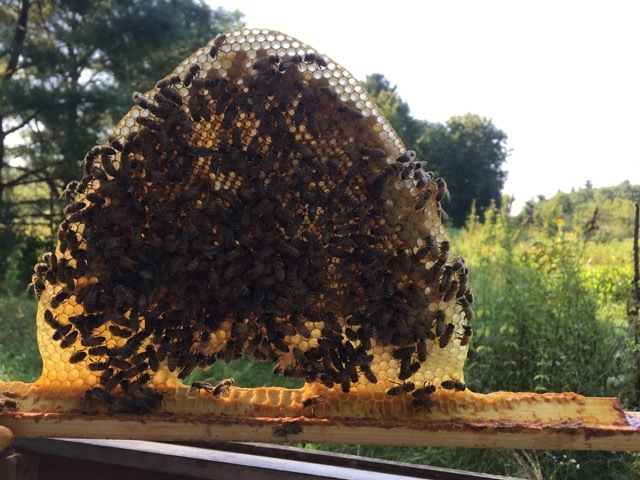 What is missing in this hive is a good amount of nectar or capped honey. 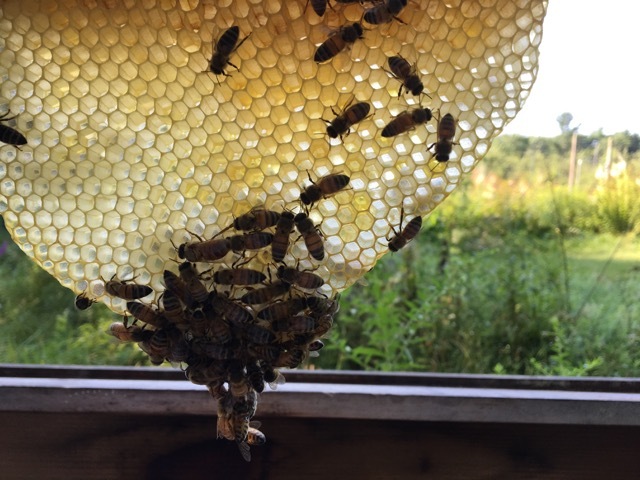 This hive is really light right now. 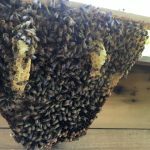 This has happened to my hives in the past. They will be empty in August and then by mid September they will have more food stores built up. The fall nectar flow helps a lot. It should be here soon. 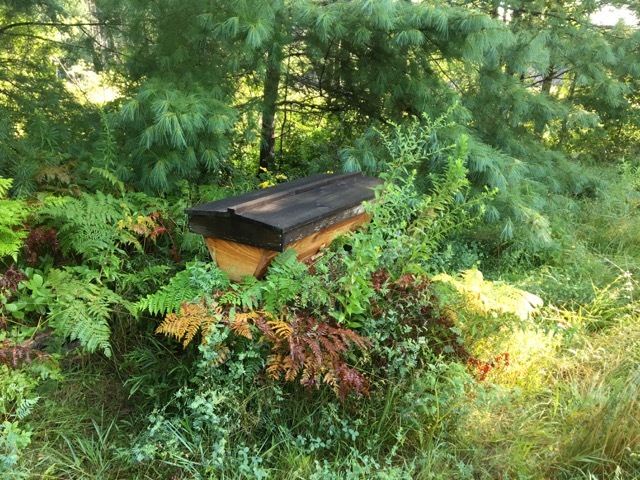 Then I headed over to the Orchard Hive. 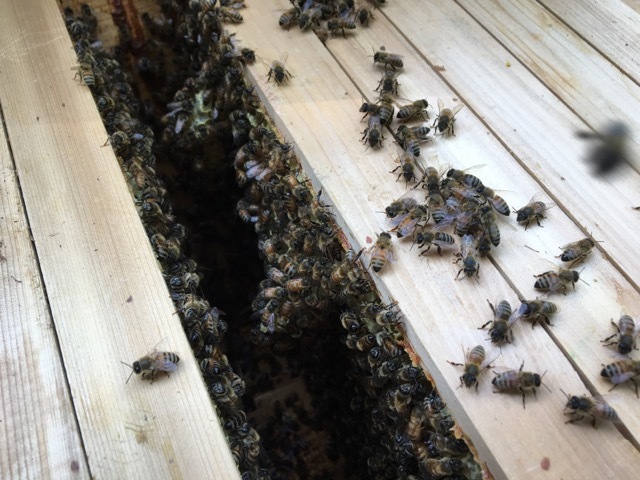 This colony was so much easier to work with, they were very calm. 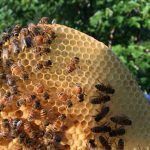 They are also very low on food stores and in need of a nectar flow. 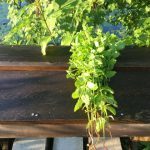 Let’s hope it starts soon! 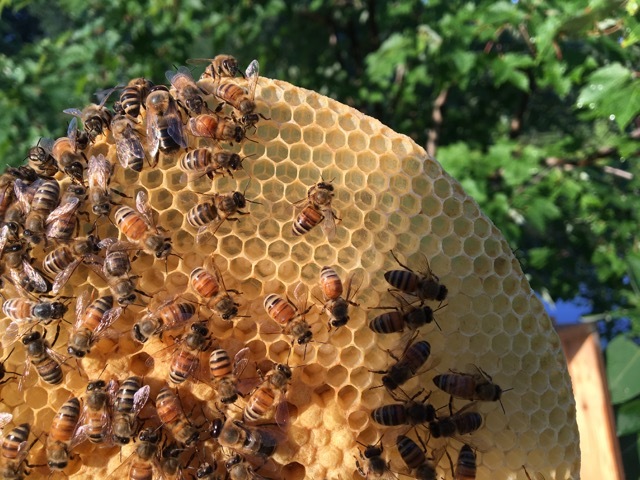 The queen looks great and she is working hard at keeping the colony at a good size. 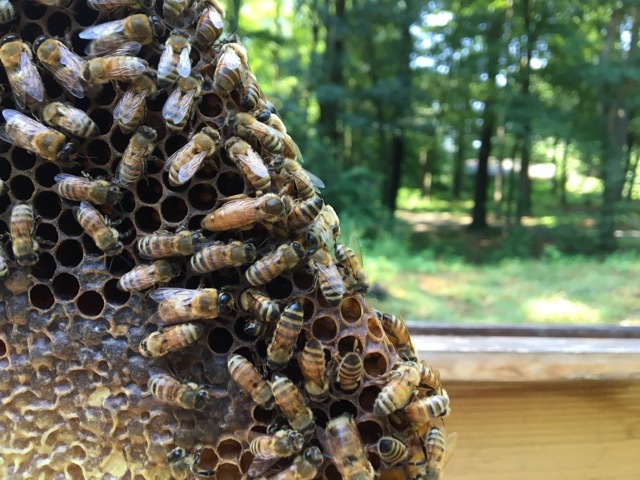 There was a lot of brood at all stages. I found 5 empty queen cups, they look like they were just practice cups. 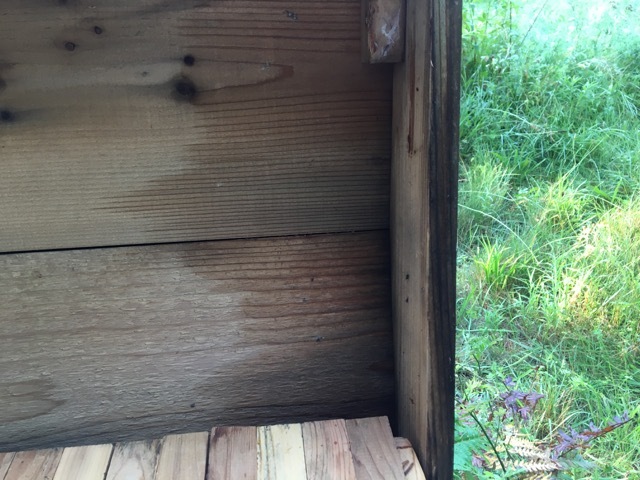 Both of the hives at Old Frog Pond Farm had some dampness under the lids. 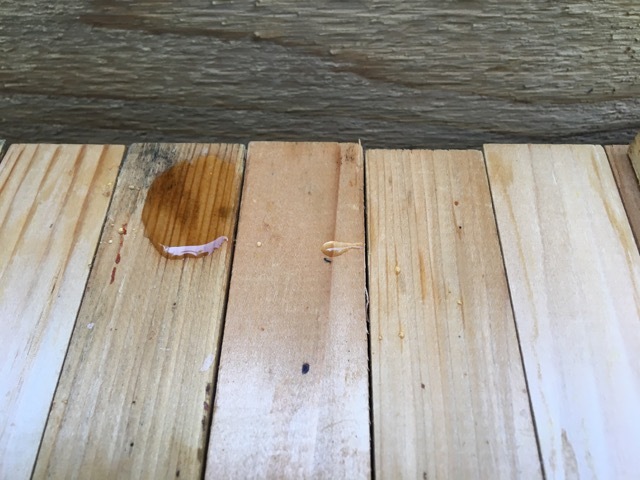 The Orchard Hive even had a small puddle on one of the bars. 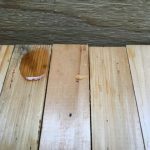 I will have to investigate what will be the best way to deal with this. 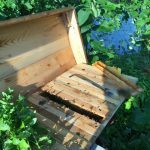 The last thing that I want is water in the hives when the weather gets cold. 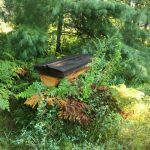 I will also need to add feeders into these hives soon. 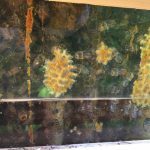 At the Healing Hive things sounded strange. 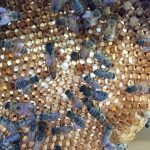 The buzz coming from the bees was almost mournful. 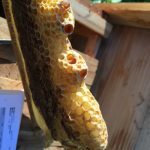 I have heard this buzz before in the Orchard Hive when they were queenles. It is such a sad sound. 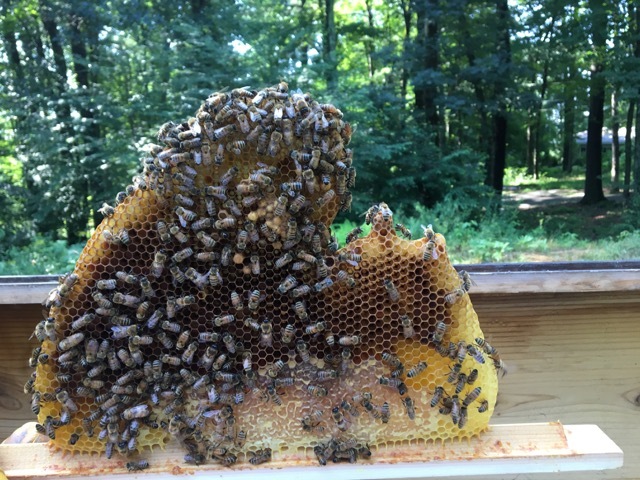 This colony is fairly small and they haven’t been building any new comb. I removed 6 of the 7 empty bars. 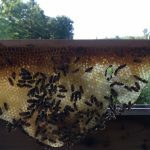 There is some brood in the hive, but it is mostly drone. 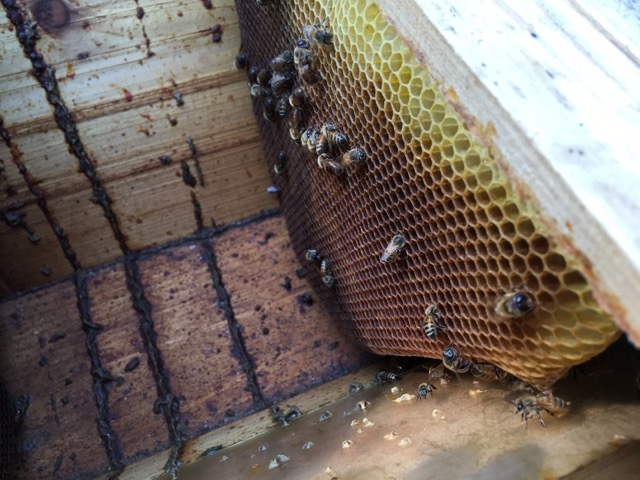 There are eggs in the worker brood comb though, so hopefully the number of drones will go down. 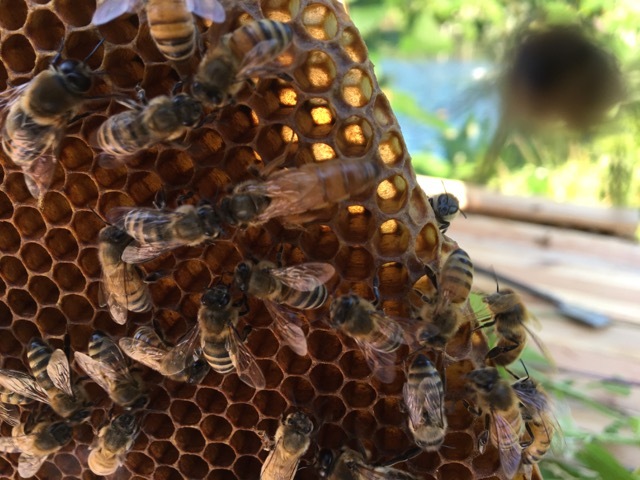 I did find the queen, but she is definitely smaller than the other queens. 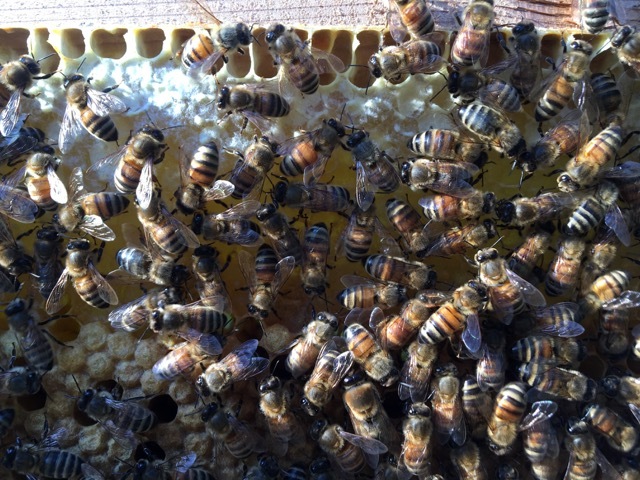 There were also 6 queen cups, 1 was capped and 4 had larvae in them. 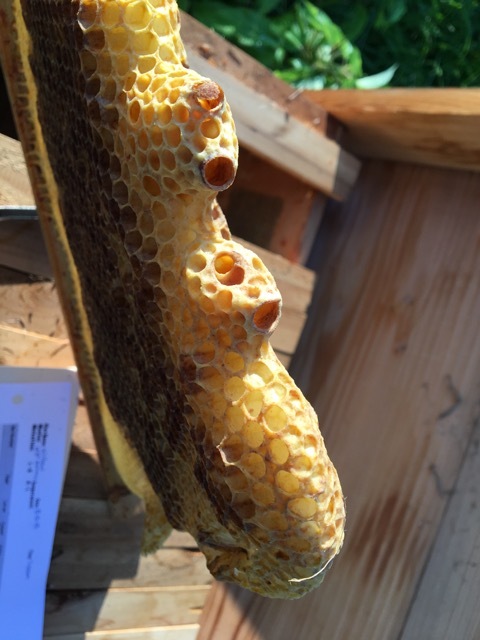 This hive had a little more nectar and honey than the two others, so that was good to see. 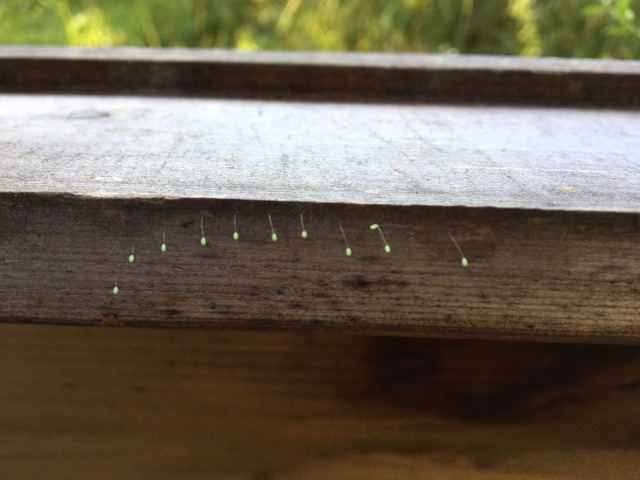 This colony is not looking or sounding great, it will be interesting to see how things are the next time I am here. 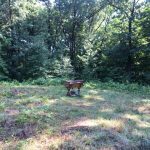 I did not get into the Meadow Hive today. 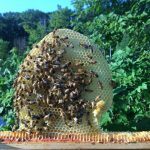 That hive is going to need a lot of time and I need to get better boots to protect my ankles. 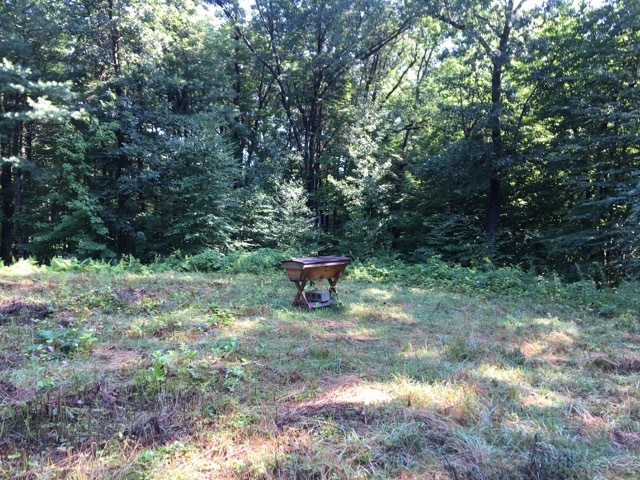 The Meadow Hive will have to wait until I am fully prepared to open it up. 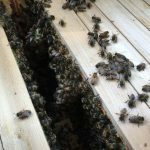 That colony is a big one and I am having difficulties with the bars, so I want to make sure that I can give the inspection as much time as I need. 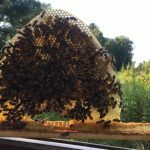 It’s so much better not to try to rush when working with the bees. 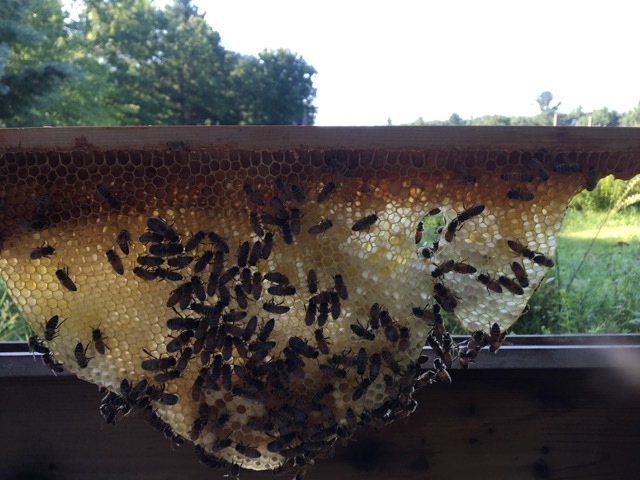 It was good to see that even though I was gone for a month, the bees were fine. Of course, they have been doing this a lot longer than I have! 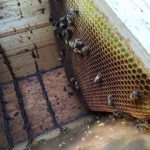 Now I need to prepare to put feeders into the hives and deal with the dampness in the lids. It won’t be long until I need to be working on the winter preparations.